Being Gluten-Free Vegan: Beyond the Animals: Vegan for the Enironment, too. 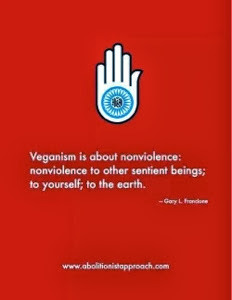 Beyond the Animals: Vegan for the Enironment, too. On tumblr this girl posted about why she doesnt eat animals and it really connected with one of the major reasons i dont- The Environment! I am a student, training for a career in which I will do my best to protect natural and wild areas. Clear cutting is one major enemy of me and my colleagues. In many parts of the world, the number one reason for clear cutting is, you guessed it, cattle. Cows need grass to eat, and it’s hard to feed them with a pesky forest covering up all your grassland. Additionally, the amount of water used and the amount of green house gas emissions related to the meat industry are outrageously high compared to other food choices. So, I don’t eat animals because it’s the right thing to do for the planet. I totally agree. For me, it goes beyond the treatment of the animal it is also about the treatment of the Earth. There is a Kenyan Proverb that says “Treat the earth well. It wasn’t given to you by your parents, it was loaned to you by your children.” This is also the basis behind seventh generation brand- live your life based on how it will influence seven future generations. It isn’t a lifestyle for everyone but it is something I strongly believe in. Also it is good food for thought. she got some negative reactions to it (duh all people who are opinionated do) which i think is silly because that's what she believes in and it is the basis of something huge in her life. anyway baby rant over. Just know there is an environmental aspect to veganism that most people dont know about/think about and i think even if you (meat eaters) dont care about the animal care about our planet and our future well being.